A Practitioner's Guide to Freshwater Biodiversity Conservation brings together knowledge and experience from conservation practitioners and experts around the world to help readers understand the global challenge of conserving biodiversity in freshwater ecosystems. More importantly, it offers specific strategies and suggestions for managers to use in establishing new conservation initiatives or improving the effectiveness of existing initiatives. The book: offers an understanding of fundamental issues by explaining how ecosystems are structured and how they support biodiversity; provides specific information and approaches for identifying areas most in need of protection; examines promising strategies that can help reduce biodiversity loss; and describes design considerations and methods for measuring success within an adaptive management framework. The book draws on experience and knowledge gained during a five-year project of The Nature Conservancy known as the Freshwater Initiative, which brought together a range of practitioners to create a learning laboratory for testing ideas, approaches, tools, strategies, and methods. 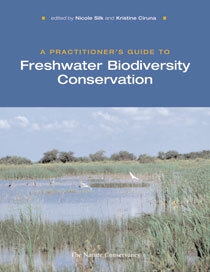 For professionals involved with land or water management-including state and federal agency staff, scientists and researchers working with conservation organizations, students and faculty involved with freshwater issues or biodiversity conservation, and policymakers concerned with environmental issues-the book represents an important new source of information, ideas, and approaches. "[The book] should serve very well as an overview text for advanced undergraduates and as an essential reference for workers in the field (or the swamp). The lists of institutions, policies, and publications are, by themselves, worth the price of admission." -The Freshwater Crisis: Why Should We Care? -What Biodiversity Should Be Conserved and Where Should It Be Conserved? -How Can the Biodiversity Be Most Effectively Conserved?